Biomechanics is the study of the functioning of the body in movement using mechanical principles. It is highly relevant to riding because here we have two biomechanical systems, each with their own normal way of functioning, coming together to influence each other. In order to bring about the right biomechanical dynamic of the two systems working together, we need not only to understand that of the horse, but crucially that of the rider, for it is the rider who changes the dynamic from something unbalanced to a harmonious unified entity. 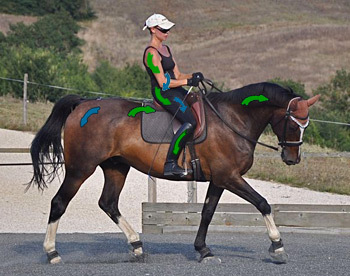 The biomechanics of the horse that allow him to carry a rider well are becoming more generally understood, although perhaps not nearly enough as they should be, at least the information is becoming more available to those who seek it. For rider biomechanics however, it seems that within the little information that is available, there are a great many opposing opinions of what is correct, and many riding instructors and trainers choose to ignore the role of the rider's gymnastic use of their body, preferring to focus entirely on the horse. The problem is that the correct horse biomechanics are only brought about by the correct rider biomechanics, and for the rider to achieve this is every bit as much of a taxing gymnastic training process as is that of training the horse. This is because whenever a rider sits on a horse their body meets with powerful forces generated by the way the horse moves. Since the horse's natural way of moving and balancing is not conducive to carrying a rider in balance and with optimal postural strength, the rider must train their body to be able to meet these unbalanced forces generated by the horse's movement and channel them into something different. Just as horses don't naturally possess the postural strength, straightness and suppleness of joints to be able to carry a rider in consistent engagement, the human body is not naturally set up to perform the skills required by good rider biomechanics, the skills that bring about the unique transformation in the horse that is engagement. Why so much contradicting advice about rider biomechanics? If you have spent any time reading books about dressage or good riding, you will probably have noticed that although the ideal portrayed of how the horse should go is usually the same, when it comes to the nitty-gritty of what the rider should do with their own body to achieve this (the rider biomechanics), there are many fundamental differences of opinion, whether it be in the writings of the 'great masters' or those of modern-day experts. For example it is often said that the rider should be completely relaxed, and yet equally that a great deal of effort must be put into riding well. Most schools of dressage stress the importance of lightness of the aids, and yet forceful riding is accepted at the highest level of training. And within the rider's position, there are considerable differences of opinion as to what is correct. A great deal of it is down to confusing the end with the means, that is, not understanding that becoming a good rider is a process. What you achieve in the end is not the same as what it took to get there. For example when we look at the effortless grace of a ballet dancer, we do not see the endless hours of hard work building up muscle strength, suppleness and specific muscle memory that it took for the dancer to be able to express such ease in the control of their body. The following example illustrates this point well. In riding there is an often-quoted saying in dressage that the rider's legs should hang like wet towels draped over the horses sides. Many riding trainers interpret this analogy as that the rider should completely relax the leg, letting it hang loosely in long stirrups in order to achieve this feeling of the wet towel. In fact nothing could be further from the truth. The true wet-towel-draping-round-the-horse's-sides feeling is the result of years of muscular effort in order to form the human leg, by the suppling of the joints, building up of certain muscle groups and stretching out of others, so that it becomes physically capable of wrapping round the horse's ribcage with ease. So the effortlessness is the result of the effort that it took to get there. And in fact, like any athletic or gymnastic discipline, the relative ease of an accomplished physical skill must always be maintained (and can always be improved upon) by a continued level of relative effort. This is especially true of the rider's correct leg position, which is such a difficult thing to achieve that, as Charles de Kunffy says: 'riders die ignorant of it'!! Nevertheless in my own experience, what was to begin with a seemingly impossible task to acquire a leg which stays in the right place and is effective in that position, has now become a reality after years of effort (even though there is always plenty of room for improvement!). The rider, however, who attempts to achieve the 'wet towel' by simply relaxing the leg as much as possible, with overly-long stirrups, will end up years later with a leg that is just as stiff in the joints and incorrectly positioned as it was to begin with, because no gymnastic development took place. The wet towel feeling will not have been achieved because a leg with joints that are not supple, and muscles that are only developed for human locomotion, is not capable of hanging around a horse's sides. This is the paradox of the means and the end in riding, which applies not only to many different aspects of the rider's position and aiding, but also to the process of training the horse. The other paradox concerning rider biomechanics is to do with the functioning of different elements of the rider's body, and this explains why there are so many conflicting opinions as to what the correct riding position actually is, and how to achieve it. This comes back to the same question of why some teachers say the rider should be relaxed to harmonize with the horse, and others talk about physical effort. In fact riding well - riding for engagement - is a combination of parts of the body that must harmonize with the horse through the suppleness of certain joints and relaxed stretching of certain muscles, and other parts which must work to maintain the postural re-balancing of the horse, and to channel the flow of movement in the right way. This is a bit like being both the banks of a river and the boat that sails down it. It is the difficulty of developing the body in such opposing ways that makes riding such a challenging and unique discipline. What is fascinating is that when you start to break down the different element of the rider's body into which are harmonizing with the horse's movement, and which are working posturally to re-balance or channel it, you discover a perfect pattern of alternating functions that makes the whole system work in a dynamic way: one part holds posturally (shown by the blue arrows in the picture below) allowing the neighboring part to harmonize (green arrows), and vice-versa. This is the beauty of correct rider biomechanics. In terms of the effect on the horse, the harmonization allows the connection of the rider to the horse's movement that is so vital, whereas the posturally-holding parts do the hard-work of re-balancing and channeling the whole horse. Both are indispensable to the dynamic of engagement - without the banks there would be no river, but without the boat you couldn't go anywhere on it. A rider who attempts only to harmonize or 'go with' the horse will end up as a passenger to the horse's natural lack of balance for carrying a rider. 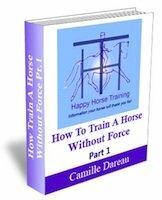 Whereas the rider who only 'comes against' the horse with too much holding throughout their body will only bring about resistance in the horse. Even more remarkable than this dynamic of rider biomechanics is the fact that exactly the same pattern of opposing or balancing forces is present in the engaged horse: a series of muscle groups that perform postural holding (have a 'backwards' direction) counterbalancing with parts of the horse's body that stretch, carrying the movement forwards. Together they form the ring of engagement (see What does on the bit really mean?) which functions like a big wheel rolling round to carry the movement forwards through the horse's body. And what we are saying here is that the correct rider also has a ring of engagement in their own body, with the direction it rotates being the opposite to the horse's ring, so that both connect together just like two cogs in a mechanism. This is what provides the unique possibility of unhindered transmission of movement through two separate entities within a balanced structure. 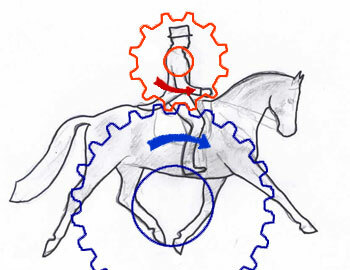 This cog dynamic is why, of the two main parts that connect between horse and rider - the seat and the horse's back, the rider's seat must engage in the flow of movement under and forwards and round (red arrow in the diagram), and the horse's back corresponds in an over and forwards stretch (blue arrow). This forwards stretching in both horse and rider is made possible only by the right postural support from the core muscles. For more on the correct seat go to The Independent Seat. Unfortunately, instead of initiating it, most riders are inhibiting this essential forwards stretch in the horse's back with a wrongly positioned pelvis, due to the fact that they have never developed the right postural strength to allow their seat to actually engage with the movement. Without this connection there can be no postural control of the horse by the rider, only control (or conditioned control) with the reins. Training Philosophy: A tale of two boats uses an analogy to explain the difference between committing yourself to the horse's movement to achieve true engagement, and resorting to the 'easy option' of holding-on with the reins. Understanding the rider biomechanics of bending the horse correctly are also crucial to training, since it is through bending that the rider can increase the strength and straightness of forwards transmission from the hindlegs. The rider's control of their weight distribution and postural structure are essential for this. To understand, as a rider, exactly what the different elements of correct rider biomechanics are, and how they should function gives you so much more clarity. It goes a long way to reducing the frustration that is very common when you don't know which bit of your body should be doing what, and why it's often so difficult to do the right thing. Of course, looking at a picture with arrows on it is never going to enable you to know how to train your body for good riding. What you need is clear instructions on how you position your body, what it should actually feel like, and most importantly what response you should get from the horse - this is the only true validation of good riding. If you want to develop the wonderful ability to engage the horse, you need to know not only how to train your body, but in what order, so that eventually everything comes together in the right way. 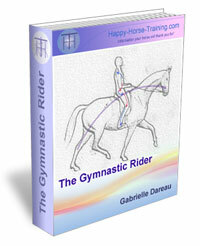 This is what The Gymnastic Rider eBook, available exclusively from Happy Horse Training, is all about. Riding in this way) (what we call 'Real Dressage', with postural engagement as the means of bringing the horse's movement into balance, is not about quick-fix tips, or what kind of bit you use. It depends on the rider developing and applying their own body in a specific way, a way that is rarely clearly explained in dressage teaching. If you would like to know how to do this, in a fully detailed step-by-step way, then The Gymnastic Rider eBook can show you how to go about it, or fill in any gaps you may have in your understanding and technique. 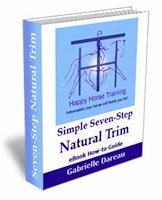 How To Ride A Horse In Balance gives you full details of the book, and the philosophy behind it, as well as the opportunity to download the 15-page introduction to the book for free. What does 'on the bit' really mean? What is real dressage riding? Training horses: the whole way!